Add a colorful twist to your cool weather looks with cozy women’s flannel shirts from Old Navy. Take cool weather style to new heights with the refreshed edits of on-trend plaid flannel shirts for women. 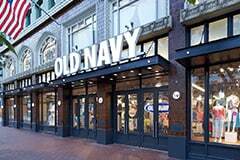 Explore the wide variety at Old Navy that has emerged as a fashion-forward staple this season. Perfecting a balance between casual chic and tomboyish style, these comfortable tops are cut from ultra-soft cotton in relaxed, button front styles that are fitted just enough to flatter the feminine silhouette. Select from the many crisp patterns such as timeless plaids and checks that are a key motif for this season’s casual looks. They offer an effortless way to infuse attention-grabbing style as well as bold color schemes into your wardrobe. The boy-borrowed style of these comfy and undeniably feminine separates will become your favorite excuse to make every day a laid-back occasion. Give your everyday line up a new and affordable upgrade with these lightweight yet cozy flannel shirts. Reinvigorate your casual attire with a touch of intriguing colorful patterns from these best flannel shirts at the best prices. Have some fun creating versatile looks that will have you feeling both comfortable and effortlessly chic before heading out the door. They never fail to look particularly cool when worn with a favorite pair of jeans tucked into either mid or high-rise denim. Wear it open over a tee or tank top as a smart alternative to a jacket. It will look equally hip layered over a solid turtleneck for a perfect chill blocking combo. Roll or bunch up the long sleeves to give a more laid-back vibe. Their trendy slouchy fits make a cool contrast when paired with stretchy leggings or slim-fitting pants. Reach for one as a fabulous light layer of warmth whether you’re at the office or lounging around the house. 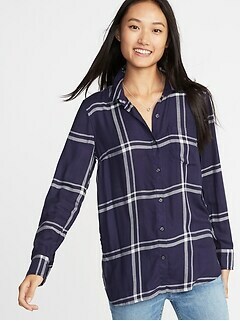 Wrap yourself in stylish comfort this season with your choice of these inexpensive flannel shirts. 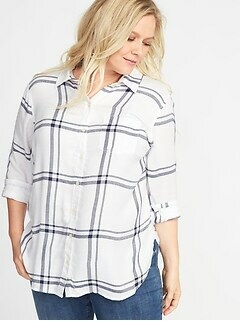 Revamp your casual flair with these affordable and super cute flannel shirts from Old Navy.